Since I enjoy looking at women in hats, and my bride refuses to wear them I'm occasionally forced to troll the electronispere for my fix. I fell hard, head over heels in like with this photo. Doesn't she look like she'd be fun to share a julip with? Mad, bad and dangerous to know. You'd think that she'd be a bit more wary of attracting a brobdingnagian honey bee to that thing, but yeah...she looks like she'd be a hoot. Is that really a hat or has she been taken hostage? 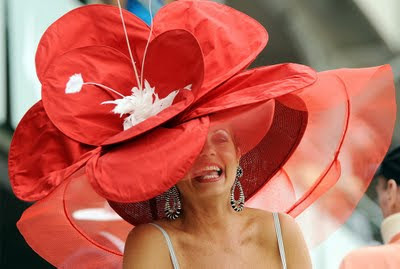 I personally think that her hat is gorgeous, like an overblown poppy that is starting to wilt in the sun.